Over the years, that design languished as I moved on to other interests. When I first saw Groove (before Microsoft purchased it) and Wave, it brought back memories of those designs. Wave, in particular, was very close to what I had imagined building (albeit without all of the crazy in-line edits and what not). I had kind of given up the idea after not being able to find any direction myself on how to make such a tool useful. Everything else? I guess it’s kind of mediocre. And yet, organizations — multi-billion dollar organizations — depend on SharePoint as a platform for collaboration, communication, sharing information, and in general, getting things done. This is what experience has taught me as I sat through scrums watching folks update list items, as I dealt with the deluge of emails sent “Reply All” trying to figure out the status of tasks, and as I dealt with communicating effectively as a part of a team of remote consultants. There are real inefficiencies when you try to use out-of-the-box SharePoint for scenarios which it was not designed and it’s not a terribly useful platform for collaboration so much as it is for storage and retrieval of information (and even some would debate how well it’s designed for those purposes….). The question we set out to answer is how can we make the SharePoint platform more efficient for collaboration? How can we help teams that work with remote members collaborate and communicate effectively? How can we make SharePoint more than just a document and information repository? How can we enable SharePoint to deliver notifications and updates in real-time? Right before Christmas, my wife was put on strict bed rest at home carrying our daughter, Charlotte (she was deemed a high risk pregnancy as we’ve lost three other fetuses in two prior pregnancies). At first, I considered taking the 6 week unpaid family leave. But our due date was at the end of April; that would hardly get me through February with my vacation days. I knew I had to quit and tough it out for at least these 4 months to make sure that we carried this baby to term. This is when I finally put two-and-two together: I had to use this one opportunity to take a risk, go all-in and try to manifest this idea that I’ve been carrying around with me for years. We’ve been “dogfooding” it for over a month now! 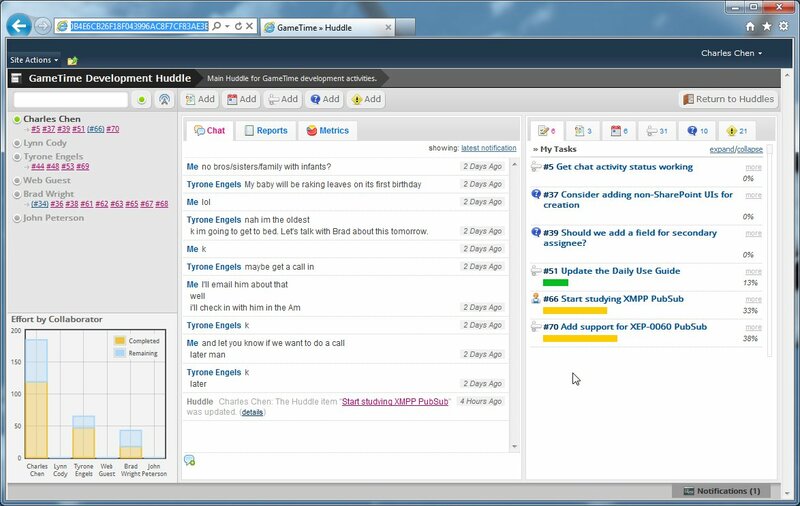 What came out of this process is GameTime, a real-time collaboration solution built on SharePoint and the same underlying technology in Google Wave, XMPP. In one sentence? It’s Campfire for SharePoint. 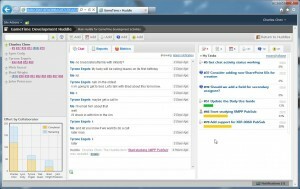 At the core of GameTime is the concept of a “Huddle” where team members come together around a web-based chat interface. But it’s more than that; we’ve integrated it with SharePoint document libraries and lists to create a context for real-time collaborative efforts right in SharePoint. Each Huddle is composed of collaborators, documents, milestones, and tasks — the essentials of any collaborative effort and it’s all wired up to react in real-time. When a document is checked out in SharePoint, a real-time notification shows up in the chat stream and the document is updated in the Huddle. When a new task is created and assigned, a real-time notification shows up in the chat stream and the task is added to the Huddle. When a user comes into the Huddle, a real-time presence notification is sent and the user’s status is updated immediately in the Huddle. GameTime finally gives SharePoint users an actual reason to be in the SharePoint environment outside of point interactions (for example: trying to find a document); it gives SharePoint a central role in day-to-day collaboration instead of being just a storage repository that is called upon once in a while. But even more importantly, perhaps, is that it adds a real-time element to SharePoint. No more waiting for email notifications. No more playing email-tag to get the status of tasks. No more waiting for someone to check documents in/out. You can see SharePoint activity in real-time right from your Huddle. It’s taken the small team of John Peterson (and his alter ego “Tyrone Engels”) and myself nearly 4 months of work to get GameTime to this point and just this week, we’ve started our first AdWords campaign — a great milestone. The challenge of spreading the word and getting our first sale is now before us so indulge me with this shameless plug! If your organization runs SharePoint 2010 (Server or Foundation) and you’re interested in trying out that real-timey goodness of GameTime, fill out our contact form and get your first 10 licenses, free. You can also use the form to schedule a live demo in our hosted environment. I truly believe that you’ll be sold once you experience it, live. Chat and real-time notifications everywhere in the SharePoint environment — get immediate notification of changes anywhere you are SharePoint. So head over to our web site: http://thinktastic.com and contact us to get a fully featured trial license!